Pen, ink, chalk and gouache on paper. 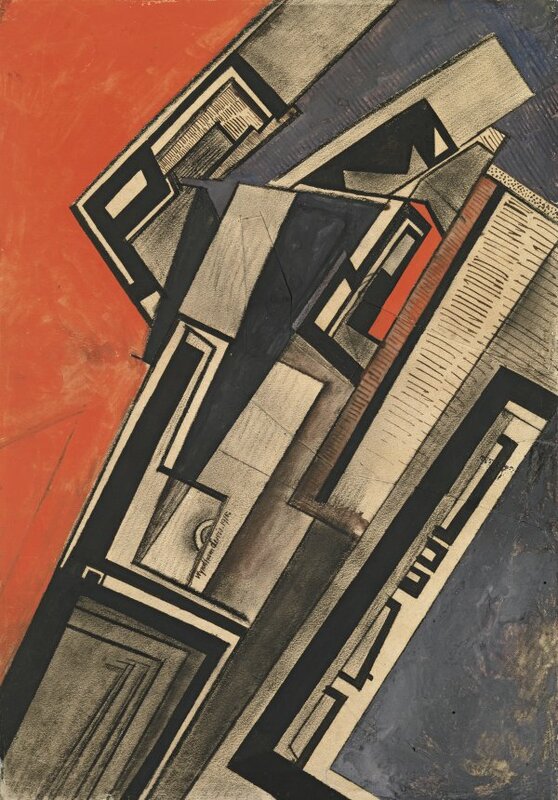 Dated 1915, the present Composition in Red and Mauve, which belonged to the Vorticist painter Helen Saunders, exemplifies the geometrical and abstract style employed at the time to mechanise urban life. The thick black diagonal lines form a sort of scaffolding that rises to the upper part of the composition. Lewis’s repetitive artistic language is close to that of the Italian Futurists. The difference between the two movements, as Lewis wrote in 1939, lay in the fact that Vorticism accepted the world of machines, identified with “the brutality of mechanical life” and sought to achieve “machine forms, ” whereas the Futurists aspired only to imitate mechanical movement. Head of a Woman. Kiki?